Shops on the main road running through Longido. Mount Longido can be seen behind, however the peak isn't visible from here. 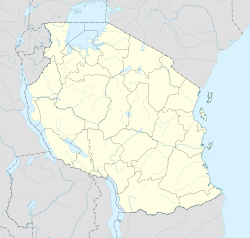 Longido is a small town and ward in Arusha Region in Tanzania. It is the administrative seat for Longido District. Most of the inhabitants are Maasai, but there are other East African tribes as well. Longido is at the foot of Mount Longido which can be climbed in one and a half days. Longido includes some basic accommodation (guest houses), restaurants, bars and general stores. There is also a police station there, several churches and a primary and secondary school. The only electricity in the village is by private generator. A 1928 ascent of Mount Longido is described in Vivienne de Watteville's book Speak to the Earth (1935). Anyolite was first discovered at the Mundarara Mine near Longido in 1954. In 2007, Longido became the capital of Longido District which was formed out of part of Monduli District. In addition to the town of Longido, the ward includes the village of Engikareti. ^ "Postcodes Arusha Region 23000" (PDF). 2012. This Arusha Region location article is a stub. You can help Wikipedia by expanding it. This page was last edited on 12 June 2017, at 08:39 (UTC).